The potential of unikernels is great (as you can see from the work above), but there hasnâ€™t been a massive adoption of unikernels. Why? Development time.Â For example, developing Minipython, a MicroPython unikernel, took the better part of three months to put together and test. 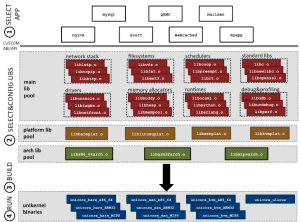 ClickOS, a unikernel for NFV, was the result of a couple of years of work. Whatâ€™s particularly bad about this development model, besides the considerable time spent, is each unikernel is basically a â€œthrowaway.â€ Every time we want to create a new unikernel targeting a different application, developers have to start from scratch. Essentially, there is a lack of shared research and development when it comes to building unikernels. We (at NEC) wanted to change this, so we started to re-use the work and created a separate repo consisting of a â€œtoolstackâ€ that would contain functionality useful to multiple unikernels — mostly platform-independent versions of newlib and lwip (a C library and network stack intended for embedded systems). This got us thinking that we should take our work to a much bigger level. We asked the question: Wouldnâ€™t it be great to be able to very quickly choose, perhaps from a menu, the bits of functionality that we want for an unikernel, and to have a system automatically build all of these pieces together into a working image? It would also be great if we could choose multiple platforms (e.g., Xen, KVM, bare metal) without having to do additional work for each of them. The Unikraft build tool is in charge of compiling the application and the selected libraries together to create a binary for a specific platform and architecture (e.g., Xen on x86_64). The tool is currently inspired by Linuxâ€™s KCONFIG system and consists of a set of Makefiles. It allows users to select libraries, to configure them, and to warn them when library dependencies are not met. In addition, the tool can also simultaneously generate binaries for multiple platforms. Developerâ€™s guide: available in the docs directory of the Unikraft sources at http://xenbits.xen.org/gitweb/?p=unikraft/unikraft.git . Please donâ€™t be shy about getting in touch with us, we would be more than happy to answer any questions you may have. You can reach the core Unikraft development team at sysml@listserv.neclab.eu .